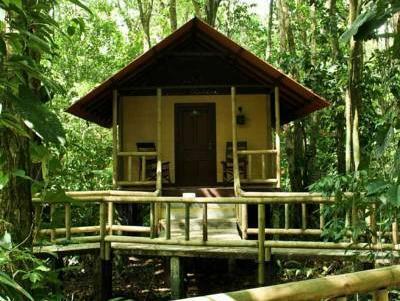 ﻿ Best Price on Evergreen Lodge in Tortuguero + Reviews! The Evergreen Lodge is located amid Tortuguero National Park, and offers spacious rooms, complimentary meals, free Wi-Fi and massage services. The rooms feature an elegant décor with wooden furniture, a seating area, ceiling fan, and private bathroom with shower offering free toiletries. Evergreen Lodge invites its guests to enjoy massages in the on-site wellness center. Guests may also enjoy the surroundings from the terrace. Some of the activities that can be performed in the surroundings are hiking, fishing or just take a swim in the outdoor swimming pool. Early (6:00 a.m. - 6:30 a.m.) transfers to/from San José Hotelscan be arranged while it is Included in the full board meals room rate as well as two guided tours to surrounding landmarks, bilingual tour guides and a complimentary welcome drink. Please note this property is accessible only by boat. Please contact the property for more information. Prices include transportation to/from San Jose city, two guided tours to surrounding landmarks, bilingual tour guides and a welcome drink. It doesn't include alcoholic beverages, soft drinks or bottled water, entrance tEl Tortuguero National park, tips or any other services not mentioned. Please inform Evergreen Lodge of your expected arrival time in advance. You can use the Special Requests box when booking, or contact the property directly using the contact details in your confirmation. Guests are required to show a photo ID and credit card upon check-in. Please note that all Special Requests are subject to availability and additional charges may apply. Конечно, Evergreen Lodge - вроде, как настоящие джунгли. Но... НИГДЕ (ни на сайте отеля, ни в BOOKING.COM, ни в AGODA.COM) не сказано о том, как будет трансфер, зато расписано, что бесплатный трансфер от/до отеля в Сан Хосе/аэропорт. Трансфер в лодж - один раз в день - в 05:45 утра, из лоджа - тоже один раз, что-то около 11:00. Если бронировать будете, то обязательно это учтите! Два бассейна немного спасают отсутствие возможности купаться - в реке грязно и крокодилы, в Atlantic Ocean - большие волны, отбойное течение и бывают бычьи акулы. Зато с претензией на экологичность отеля - нет стёкол (сетка) в домиках, нет холодильника, ТВ, освещение еле-еле, роуминг от МТС и Мегафона перестал работать километров за 20 до отеля. Самое страшное - заказали wake-up на 04:40 утра - никто не разбудил, пришли на ресепшн - никого, бросили ключи и уехали. Из-за отсутствия инфо налетели на 330 долларов - такси от и до отеля, лодки от и до отеля. Зато деньги исправно сняли с карты, хотя при бронировании указывалось, что деньги платить в отеле.